Academics commissioned by TV channel Drama have carried out a study to reveal the "first historically accurate" portrait of Jane Austen's fictional character, Mr Darcy. 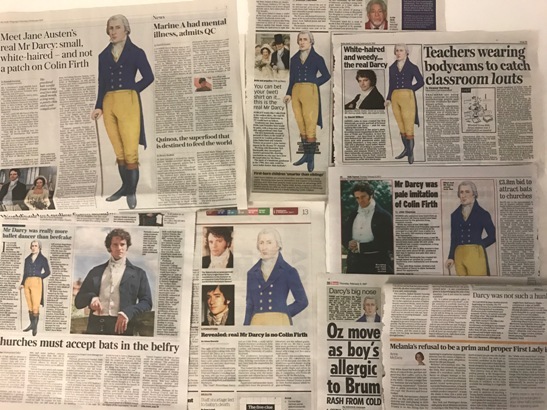 The likeness, created by illustrator Nick Hardcastle (see video below), has appeared in a number of national newspapers this morning. It has also gained broad coverage online, according to consumer PR agency Taylor Herring, which led the campaign. Hardcastle's drawing of the Pride and Prejudice leading man counters the modern portrayal brought to life by actors such as Colin Firth, and instead paints the picture of pale man with powdered hair, sloping shoulders and a pointy chin. The study, conducted by UCL professor John Sutherland and Amanda Vickery of the Queen Mary University of London, is part of a five-week campaign - dubbed 'Jane Austen Season' - starting on Drama this Sunday (12 February). The campaign looks at the life and literature of Jane Austen, and film and TV adaptations of her work, and will be promoted throughout by the TV channel, said Taylor Herring managing partner Peter Mountstevens. It is believed that the 1st Earl of Morley John Parker was the inspiration for Mr Darcy, the researchers said. "What's fantastic about Jane Austen's writing is that Mr Darcy is both of the era and timeless," Sutherland said. "Our research shows how Austen herself envisioned Mr Darcy. However, the literature leaves space for the reader's imagination to create their own Darcy and bring their own fantasies to the storyline."